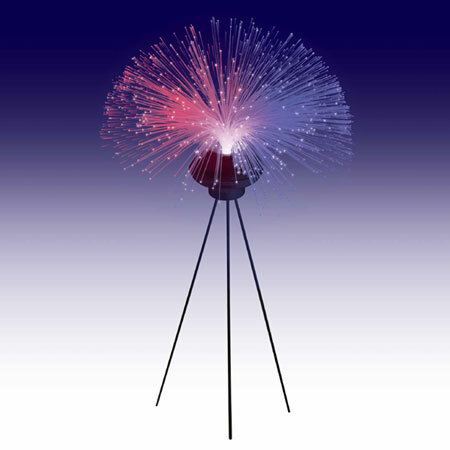 StarLight™ - There has never been a fiber optic light that does so much! Can You Imagine pressing a button and watching your StarLight™ entertain you with 29 different lighting effects? Can You Imagine choosing 1 of the 6 built-in Nature Sounds or New Age Music Environments to interact with your light show? We Did! Press another button and choose to have your StarLight™ strobe or fade - you can even select the speed of the color changes! Over 29 different functions at your fingertips plus 4 different speed controls. You can also turn your StarLight™ into a Sound Soother with its own light show by simply choosing one of six built-in Nature Sounds or New Age Music Environments. But wait, here's a really cool feature, press a button and watch in amazement as your StarLight™ begins to rotate and take on a whole new dimension. There's more - your StarLight™ is removable from its legs so it can be used on a tabletop and completely wireless so it can be used anywhere. Still more - press a button and your StarLight™ responds to Sound or Music, and YOU have complete control of the sensitivity and how it responds - extra sensitive for low music and less sensitive for loud music. StarLight™ is out of this world. StarLight™ will become your favorite piece of home decor. More than just a light and sound soother - it's furniture that entertains!